Any bathroom design is incomplete without shelves to keep the bathroom linen especially towels and napkins, bottles of cosmetics items, shampoos, shower gel, shaving kit etc. Since bathrooms have a crunch of space, it’s not possible to install large cabinets that take up ample space. Moreover, the cabinets should withstand the excess water and moisture. No wonder people go in for storage cabinets that can be put on the walls or above the toilet so that it doesn’t use up the useful floor space. Wooden bathroom shelves look elegant and classy unlike the cheap plastic or acrylic ones. Here you will find reviews of the best wooden bathroom shelves that have been categorized into groups having certain features that set them apart. These types of bathroom shelves are very unobtrusive and take the least amount of space. They use the vertical space over the toilet, above the flush tank, which in any case remain unutilized. The ‘over-the-toilet‘ wall cabinets are fixed snugly over the toilet so that the empty space can be used for keeping rolled towels, soaps and shampoos, and any other toilet accessories. These cabinets are not very expensive and they form a handy storage space which looks elegant as well and enhances the decor of the bathroom. Some of the popular and best-selling cabinets which are available in online stores are listed below with their brief description. This elegant wall cabinet in Soft White finish is manufactured by Sauder. It has an adjustable shelf behind the panel door. The door is reversible to open either on the left or right side. The lower shelf is finished in faux slate. It weighs 20 pounds and has a dimension of 19.9 x 7.5 x 28.7 inches and is small enough to be fitted easily in any bathroom. 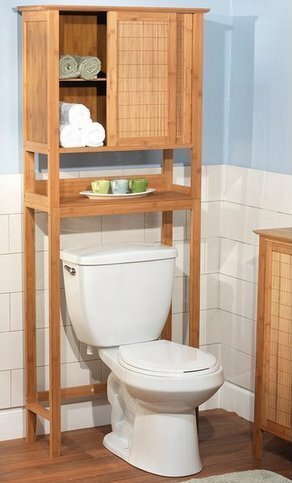 Sauder Etagere cabinet manufactured by Sauder is also a space-saving cabinet as it fits behind the toilet seat. It comes in soft white finish with a slate finish accent. It has two adjustable shelves behind the frame and panel door with a receded translucent insert which are faux slate finish. The product has cubbyhole storage with an adjustable shelf and bead board back panel. It has a dimension of 23.3 x 7.4 x 68.1 inches and weighs 31 pounds. This is a tall bathroom cabinet from the Peppercorn collection by Sauder, and this product comes in Cinnamon Cherry finish with Cascade Granite accents. The space-saving design fits over the toilet and is very convenient to keep bathroom accessories. It has cubbyhole storage having two adjustable shelves. The shelves are faux granite finish with EverSheen top-coat which gives a clear, durable finish while resisting heat, stains, and scratches. It weighs 34 pounds and measures 23.3 x 7.4 x 68.6 inches. This bamboo space saver is made from bamboo and is given a natural wood finish. It provides an elegant, earthy and natural feel. It will make your day every morning. The furniture will complement any home decor with its eco-friendly natural bamboo look and add character to your bathroom. 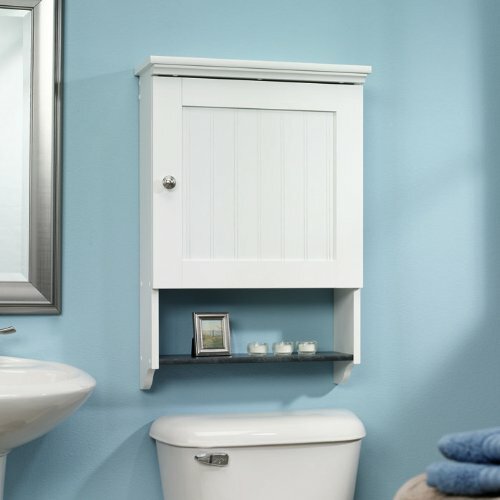 This cabinet is a great space-saver too as it fits snugly on the wall behind the toilet. The two shelves provide enough extra storage for towels, toiletries, and other personal care goods. It has a dimension of 66.93 inches high x 10 inches wide x 27.56 inches deep. Zenna Home Spacesaver is a free standing cabinet that conveniently fits over the toilet, and thus utilizes the empty space above it. It provides ample space to store towels, napkins, and other bathroom accessories. This more than five and a half feet tall cabinet has paneled doors of frosted, tempered glass that gives a cool elegant look. The Espresso color laminate finish and brushed chrome door pulls add a touch of class. Being fabricated with glass it withstands moisture, humidity and water splashes. It is easy to assemble and has six inches deep shelves. Manufactured by Zenith Products Corporation, it is a good buy for those looking for a space-saving cabinet in the bathroom. Product Dimensions : 66.5 x 23.2 x 8.2 inches; Item Weight: 32 pounds. Note:- Ladder shelves are a good choice for bathroom shelving purpose. We have reviewed different types of ladder shelves (used for book shelving) in Best Shelving Units and we believe some of them are a good fit for bathroom shelving. Read through our reviews of Best Leaning Ladder Shelves and our collection of Top 22 Ladder Shelving Units. These wooden bathroom wall shelves have the advantage of not occupying any precious floor space. These are the perfect solution for getting additional shelf space in your bathroom, without occupying any useful floor area. 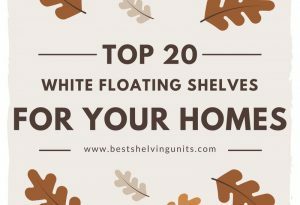 They are so beautiful and elegant that these can be used in any other room (with floor space constraints) as well where there is a need for extra shelf space. 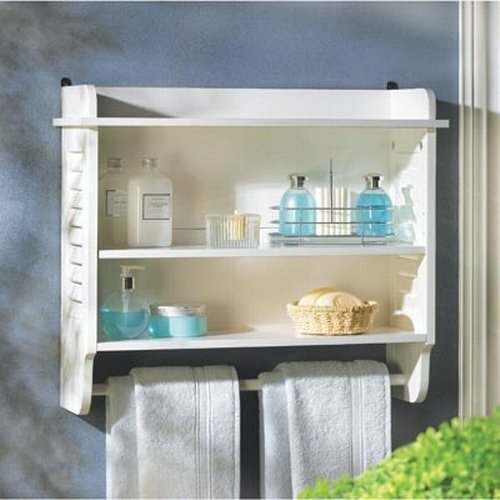 RiverRidge X-Frame Bathroom Wall Shelf is a wall mounted shelf. It is manufactured by RiverRidge Home Products and comes in white and espresso color finish. It is easy to install as well as you only need to drill two holes in the wall to mount it. Its dimensions are 26 x 7.7 x 15.3 inches. It is an elegant, small, wall-mounted shelf in a bright white refreshing finish, has two roomy adjustable shelves to hold loads of bathroom accessories. There is a built-in bar underneath to hold a towel within easy reach. Manufactured by Furniture Creations, it has dimensions of 23.8 x 8 x 20 inches and weighs 12 pounds. It is a wooden wall cabinet by Sauder, and part of the Peppercorn Collection. The cabinet comes in Cinnamon Cherry finish with Cascade Granite finish accent. It has adjustable shelves behind the panel door. On the sides, it has cubbyhole storage featuring two adjustable shelves. Reversible door can be made to open towards left or right. Lower shelf with faux granite finish features clear, durable finish Ever Sheen top-coat which resists heat, stains, and scratches. It weighs 21 pounds and the dimensions are 23.3 x 7.6 x 24.6 inches. It is a simple, elegant wall cabinet with a classic clean look. It is made of durable painted MDF and wood composite and has two shelves with ample storage space. The top can be used to keep rolled towel or any decorative item. It weighs 8.8 pounds and the dimensions are 13.8 x 5.9 x 21.6 inches. 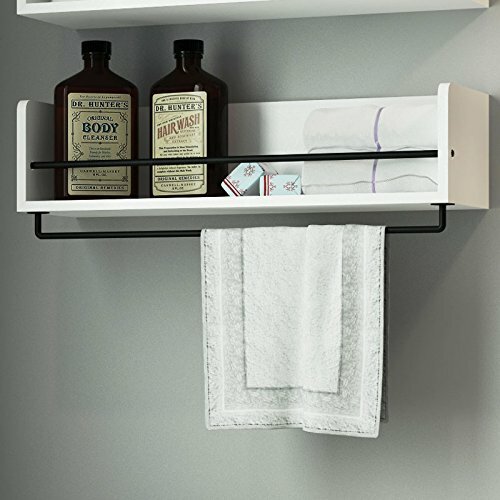 Zenna Home Slimline Rolling Storage Shelf – provides additional storage for all bathroom personal care accessories. It is a free-standing unit and has wheels so that it can be easily moved and positioned anywhere in the room. The product has side support rail to move it or keep towels and other items. It is made of wood and is available in a white finish. Manufactured by Zenith Products, its dimensions are 16 x 8 x 26.2 inches and weighs 12.8 pounds. Note:- There are lots of other models in this category of bathroom shelves. Read our review of Top 7 Corner Shelves for Bathroom to get an idea of different shelves that can be placed in a corner of the bathroom. For some, one of the most important requirements is to have a handy towel bar on the cabinet. The bathroom cabinets featured below to have a towel bar which can be used to hang towel and napkins. This Carbonized bamboo wall mounting shelf saves lots of floor space. The bamboo color and texture gives the right ‘bathroom’ feel. It is sturdy, yet easy to assemble and is manufactured by Neu Home. The product dimensions are 10 x 23.5 x 8 inches and weigh 3.5 pounds. It is a compact wall mount shelf that is very versatile. It has four towel hooks that can hold towels as well as any other items like clothes or garments. It is finished in a durable fresh white laminate made out of CARB-compliant, laminated composite wood. Its three cubbyhole compartments have room to keep anything. Manufactured by Prepac, it comes in other color finishes as well, such as Maple, Black, Espresso etc. It weighs 33 pounds and carries dimensions of 11.5 x 48 x 16.5 inches. It is a double door wall mounted cabinet with a full-width towel bar. Manufactured by Zenith Products Corporation from engineered wood, the product has a white laminate finish. Its dimensions are 25.6 x 5.8 x 19.2 inches and weigh 13.4 pounds. Note: – If you are looking for closet shelving systems, read our review of Whitmor stackable closet shelves – 2 Tier, Steel, Chrome finish. Rustic wood bathroom shelves give a vintage classic look to the decor. 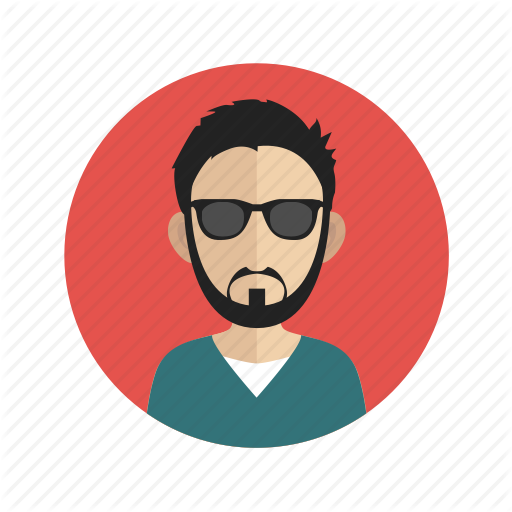 It suits those who do not prefer the commonplace contemporary look and would rather go in for something unique and classy. This is a very simple yet stylish bathroom wall shelf in white finish with contrasting black metal rails that will complement any bathroom decor. The shelf is made of wood and looks quite sturdy. It comes fully assembled with wall mounting hardware included. This shelf is so beautiful and versatile that it can be used anywhere, like in a living room or bedroom. The Product Dimensions are 20 x 6 x 5 inches and weigh 3 pounds. This Bathroom Ladder Shelf is made of wood and metal and is perfect for the bathroom. The three shelf areas feature metal rail as a barrier to prevent stored items from toppling down. The materials used are metal pipes, fittings, and wood. These are handmade to perfection. The metal pipes are thoroughly cleaned and painted black or nickel and sealed. The wood is sanded smooth, given an Espresso finish and coated with a protective glaze. Its dimensions are 22.5″L X 36.5″H X 3.5″D. This shelf brings out the natural rustic charm in a small bathroom and provides storage space without using up any of the floor space. This wall mounted organizer, which comes in muted brown color, features two large shelves and two large hooks underneath for hanging towels or any other handy item. The shelves are perfect for displaying small decorative items, picture frames etc. when installing in other rooms. A cute metal pail is also included, which can be used for putting flowers or plants. Its dimensions (in inches) are 17.50 H x 12.5 L x 5.5 W and it weighs 1.5 pounds. This wall-mounted shelf has an ancient vintage look to it that adds to its unique charm and the feel of the rustic countryside. It is made out of solid pine wood and comes in distressed brown finish and grey glaze. Manufactured by Enchante Accessories Inc. it is fully functional and requires no assembly, the hardware to install are included in the package. It is so beautiful that it can be used in any other room too. The dimensions of this cabinet are 7 x 27 x 8 inches and it weighs 2.8 pounds. Besides the types mentioned earlier, there are several more designs of bathroom cabinets that may appeal to different discerning users. many may like to look beyond the contemporary or traditional. The following are a few cabinets that have several interesting features. The Zenna Home bathroom linen tower cabinet is very useful to store towels, linens, napkins etc. or any other bathroom items. It offers a lot of storage space with a very small footprint on the floor. It has five shelves placed in a column tower, out of which three are adjustable. The bottoms two are covered with single door panels. It comes in white finish and the doorknobs are finished in chrome. The upper shelves can also be used to place decorative items. Manufactured by Zenith Products Corp. it is assembled in the USA this shelf has dimensions of 8.8 x 10.5 x 64.5 inches, and weighs 24.6 pounds. This is double door organizer cabinet featuring two adjustable shelves that give three large compartments to store almost all bathroom linens. It comes in a rich white finish and is good enough as a multi-purpose cabinet that can add to the decor of any room. The sturdy frame makes it ideal for a stackable option with multiple units. Manufactured by ClosetMaid, from CARB 93120 compliant laminated wood, it comes in Dark Cherry and Espresso finish as well. It is an ideal addition to your home utility furniture collection. It has a dimension comprising 11.7 x 24.1 x 31.5 inches and weighs 31 pounds. This wall cabinet has the advantage of keeping your floor space free and offering ample storage to keep all your handy requirements nearby. It comes in five sizes giving the width option to suit any available space. It has large double doors with silver metal door panel knobs. It is stylish with a pure white elegant finish that complements any decor and can be used, besides in bathroom, in living room, bedrooms or dining room too. The ample storage space it offers can be used to put the relevant accessories like towels, dinnerware or books, depending on in which room you are installing it. Manufactured with 100% MDF wood by Glitzhome, it is quite a dependable and sturdy product. This cabinet weighs 19.8 pounds and is 20 x 8.5 x 24.1 inches in dimension. To conclude, these extensive varieties of bathroom cabinet would pass the scrutiny of the most discerning buyer and there is a wooden bathroom cabinet for everyone that matches with his taste, liking, and decor. Just be mindful in choosing the right product that suits well with your bathroom finish and other pieces of equipment. We’ve only reviewed the products after taking certain quality tests. Avoid going for the overly cheap models, they may get damaged with time and ruin your spaces.